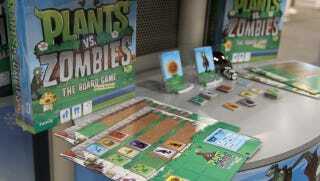 The Plants Vs. Zombies board game is real. This is a prototype, essentially the rough draft of the game that the people at Screenlife are planning on making. I spotted it at Toy Fair 2011 where it was so new it wasn't even in Screenlife's printed brochure. It'll be a 2-4 player game, with 80 zombie card, 40 plant cards and a batch of game boards on which each player will be able to place place plants and battle zombies. I was given a quick look at how the game will play, with card flips and dice rolls determining which zombies need to be placed on the board next and which plant tiles you can place against them. Players will be able to mess with their opponents' lawns, making this more of a competitive game than the PvZ so many of us have played on iPhone, iPad, computers and wherever else. The game is scheduled for a fall 2011 release, at which time the prototype boards and box you see here will be replaced with much snazzier stuff. We'll have more on the game as soon as Screenlife is ready for us to play the real thing.